Toyota's long-missing sports car was just revealed moments ago in Los Angeles for a crowd of journalists and enthusiasts. But they're not calling it a Toyota, they're calling it the Scion FR-S and they just announced it's going on sale next spring. UPDATED! You can pretty much copy and paste the information about its twins — the not-for-the U.S. Toyota GT 86 and the Subaru BRZ — and apply it to the Scion because the specs of the low, light, driver-focused cars all basically the same. You can also copy and paste the design from either one of those otherwise almost identical cars (the grilles are slightly different). What's the most popular aftermarket option for the FR-S going to be? Our guess is badge swaps. Right up front, both literally and figuratively, is the horizontally opposed boxer four-cylinder engine with D4-S injection and the all-important 86 mm x 86 mm bore and stroke (it's so important they put the 86 badge on the car twice). Power is said to be 200 hp at 7,000 RPM and 151 lb-ft of torque at 6,600 RPM. We also find out what the name means: F for Front-engine, R for Rear-wheel drive, and S for Sport. This isn't a detail you're going to need to know much of in a few months when you can order it. Just walk into any Toyota/Scion dealer and ask for "the fun one." "Serving as a laboratory for Toyota, Scion is always experimenting with new things," said Jack Hollis, Scion vice president. "The brand is iconic with the xB, adrenalized by the tC, and groundbreaking with the iQ. 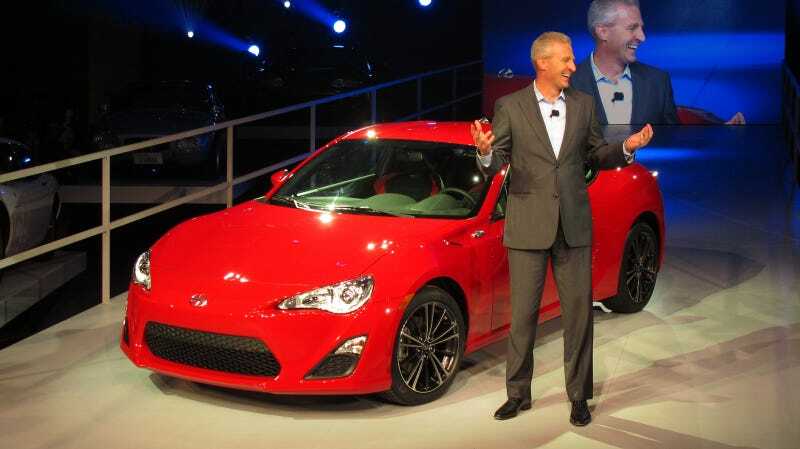 The FR-S will no doubt serve as the halo car, expanding Scion into a new dimension of driving performance." Adrenalized is a real word. I checked. The only other key piece of information missing is how much the 2013 Scion FR-S is going to cost, but for now they're not talking other than to say the price will be "attainable." Some small bit of hope that they're keeping the price low comes inside where the push-button ignition's been replaced by an actual key. The venue where they debuted the car was full of other sporty Toyota vehicles like the AE86, Corolla GT-S, Toyota MR2, Lexus LFA, and even a Supra Turbo. Lest you forget this car is going to be huge with the aftermarket, they also handed one over to GReddy for a subtle tweak. For now they just want you to try to grasp that we're living in a world where you can buy a fun Toyota with your choice of six-speed manual or paddle-shifted transmission. No more will the RAV4 V6 be the only sports car in the lineup.